Otro disco que le afano a Lino pero estará feliz de poder contribuir aquí, esta vez porque él recomienda empecinadamente a este disco. Yo lo escuché muy poco pero me pareció muy bueno. Les cuento: "Cruel Symmetry" es el tercer álbum del cuarteto alemán fundada en 2005. Las partes vocales son uno de los puntos fuertes del álbum, también apreciamos las intervenciones de flauta y el delicioso saxo en "The Story of Flying Robert", invitando a volver al espíritu de los años 70, que tienen su fuente en Yes, Genesis, UK, Camel, Gentle Giant, Robert Wyatt, Pink Floyd, Van der Graaf Generator, etc. en un disco que consta de melodías épicas condensados, con cabalgatas sinfónicas desenfrenadas, virtuosismo técnico y delicadas piezas acústicas pastorales. Con la canción que le da nombre al disco como caballito de batalla porque es un mosaico finamente engarzada donde encontramos estructuras progresivas del Canterbury, paisajes psicodélicos embriagantes y ritmos pop pegadizos. Eso es para empezar el disco. Después de la bofetada recibida por la primer pista, Argos nos ofrece seis temas que tejen una conexión entre sonidos analógicos de los años 70´s y sonidos más modernos, muchas veces con ritmos atípicos y mixturas con los más variados estilos, desde bossa-nova, música medieval, rock clásico, jazz y soul funk, y pop progresivo; todo ello da como resultado casi una hora de un excelente rock progresivo puro! Pero mucho comentario más no voy a hacer porque no escuché tanto el disco, solo les digo que viene muy recomendado por Lino y que a mí me ha gustado lo que escuché, aquí les dejo algunos comentarios en inglés para que investiguen, más los videos de siempre. Here we go ... German foursome ARGOS have presented the next surprise bag named 'Cruel Symmetry' at the end of the year 2012. Talented musicians they are without a doubt - simpatico and competent - still down-to-earth and always on the run while searching for new horizons. I'm following their paths with curiosity since the beginning in 2009, and never ever regretted having done this. Thomas Klarmann and Co. have recorded seven new songs where the epic title track is something extraordinary, you should know. Made of many twists and turns this is THE wondrous cornucopia of impressions per se - folk, canterbury, jazz, symphonic, pop - all styles brewed to a compelling prog masterpiece which also comes damn grooving in between. Of course you won't miss the beloved mellotron and Robert Gozon's Hammill alike vocals are striking again. Then Paper Ship Dreams is presented with special ease - a charming Canterbury tune juggling with strong Caravan leanings. Featuring riffing guitars, powerful drums, the last two songs Caught Within The Light and Open Book show them back on a heavier edge then, leaning into the curve again so to say. ARGOS celebrate and refine their own significant style with 'Cruel Symmetry' once again. Concerning the instrumental skills their best album probably, the song Possessions however might work better as a non vocal take in my humble opinion. This time the album's character mirrors more leanings to pop (Beatles) and folk than ever, I'm inclined to say. That means - if you are in agreement with some parts which are a bit light in weight, then nothing should withhold you. I recommend to concentrate on the compositional impact in general - and the multiple details so much the more - it's worth it. And this applies to every album they've produced so far - 3.5 stars. Another year, another release from the fabulous Taylor's Universe and an album that, as one would expect, is full of classy musical interludes. When one looks at the cover of the album you see a pair of worn out shoes that have seen better days. Luckily for the listener what is presented here does not follow suit. The album opener Floating Rats sets the table for the musical feast that has been prepared for the listener, the lamenting horns pull you in with their inquisitive tones which become dark and powerful. This theme bookends the passage whilst the filling offers warmth and depth, complex and simplistic jazz phrasings that are of the highest order confirming that Mr. Taylor has a very good understanding of structure. This structure has solid foundations and offers entertainment of the highest order in musical soirées that you will want to involve yourself in time and time again. Munich is not only the longest track on the album but, to my ears, it is the best. A very emotional piece, it displays the adeptness of the contributing musicians that comforts you like a long lost friend that you haven't engaged with for a while. To give an analogy, this piece would be akin to that conversation, filled with a whole gamut of emotion. It is this excitement that makes Taylor’s Universe such an enthralling proposition and why I love Robin Taylor's work so much; it is such a fitting musical elegy, a plaintive musical poem. Even though Imaginary Church maybe the shortest track on the album, it still packs a firm punch that really puts the band through its paces; a theme that is really noticeable throughout the whole album as you just never know what is around the corner so to speak. Just as soon as you think you have got the gist of where these guys are going, they take a sharp deviation away from that. Cruelty In Words again offers the use of conversation via musical interaction, sharp passages that appear to air their dirty laundry in front of the participating listener. I love how the keyboard has been used to great effect adding depth, as does the sax, but the real star of the piece is the blistering guitar work. Jens In Afghanistan is another winner here with its military stance and a passionate, emotional entrance that will make the hairs on the back of your neck stand up. Klaus Thrane's outstanding percussive precision waits for everyone to come into alignment, although in a somewhat chaotic fashion, something that adds to the power of the piece. Taylor's bass manipulation really scores high marks here too, making it a serious contender for the best track but it is just pipped at the post by Munich. The rather unusually titled Sergeant Pepperoni closes the album, another instrumental that allows perfect interaction for Jon Hemmersam's guitar and Karsten Vogel's alto sax to manipulate and create musical sculptures, mesmerising the listener with its exacting precision and tonal beauty. Throughout the whole album, whether through technical and convoluted guitar phrasings, mesmerizing sax soundstages or tight and fascinating percussive work, the thing that presents itself repeatedly is passion, every note here has been lived. Robin Taylor (guitar, bass, keyboards, percussion & allsorts), Jakob Mygind (soprano & tenor sax), Karsten Vogel (soprano & alto sax), Jon Hemmersam (guitar solos), Klaus Thrane (drums) and Louise Nipper (voices on Munich) have managed to perform as a well-oiled and efficient machine, a perfect combination of musicians that have seriously achieved their goal to create a highly addictive and intelligent album. As on his many other releases, it is Robin's longer passages that work the best as the music is allowed to breathe and grow with the listener; here the shorter passages have no less impact and contribute to the whole effect. Worn Out is a perfect example of how great Robin Taylor's musical mind works. 2012's Kind of Red was a stunning album that came highly recommended by these ears, Worn Out, believe it or not, is even better. Immerse yourself in Taylor's Universe and, trust me, you will not be disappointed. 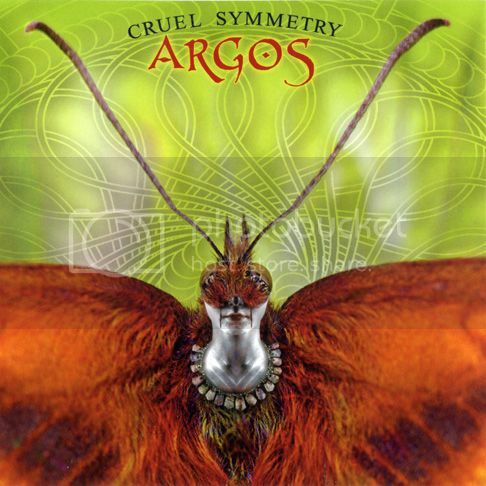 Argos lates album from 2012 named Cruel symmetry is another worthy release from their catalogue. They continue to explore the eclectic/canterbury zone as on previous albums and the result is most of the time more then ok. Very polished album with lot to offers, very diverse in manner of composing. Nice instrumental arrangements with eclectic sound, electronic keyboards and awesome voice very much towards Peter Hammill fame. Intresting orchestrations, complicated yet melodic guitar lines, some excellent keyboards and crystal clear sound overall. Definetly the cherry on the cake is the opening title track clocking around 21 min with nice moods and warm vocals. Another highlight is for sure The Story Of Flying Robert. Caravan or National Health comes in mind as influences with some Floydian atmophere here and there. I really like the combination Argus offer here of aformentioned bands, it has a very good atmosphere and is quite intresting most of the time. 3.5 stars. Argos is definetly one of the best kept secrets Germany has today in prog rock scene. With 3 album released so far they definetly are among the most intresting bands around. "Cruel Symmetry" is the third album by the german band ARGOS. They are german, but their sound is very british. Not only the words (Robert Gozon is an english teacher), the whole direction of the music, the themes and concept is pure british-progressive-rock. On "Argos", the 2009 debut, they made their statement to their influences: Genesis and Gentle Giant, the Canterbury-scene and the adult Beatles. The second album "Circles" (2010) was again a successful mixture of seventies spirit and temporary sound. The mellotron and analog synths meets "Cubase" and "Logic". And now in 2012 "Cruel Symmetry" is out. The cover (as always by Thomas Klarmann) is once more a perfect mirror to the spirit, themes, lyrics and music of the album. It starts with the title track, a 13 part- suite over more than 20 minutes (they never reached the 10-minute border before). This centerpiece has all the necessary ingredients: strong melodies, floating intrumental parts, combining themes, a textual concept and a hymnic conclusion. All the trademarks of the band were shown. The composition is sophisticated, arrangements are elaborated, the sound floats between a magic flute, prominent keyboards and guitars, opulent bass and drums and at least very individual vocols. The other six songs are on the same high level. The lyrics are well-thought-out and humorous ("flying Robert"; "his hat goes North"). The songwriting is elaborate and consequent, the music is thrilling and exciting all the time. A delicate album, tender in mood with a little heavy edge in "Caught within the light". Once again our friends at Progressive Promotions Records have delivered us another prog/rock masterpiece ... this time from the amazing German group Argos. And unlike the metal-prog band Retrospective, which I reviewed a week earlier (also on the Progressive Promotions label), the music of Argos comes from an altogether different place, residing in a prog/rock sub-genre somewhere between neo/prog and Canterbury. But first a brief history for those unfamiliar with the band. The roots of Argos can be traced back to multi-instrumentalist Thomas Klarmann who was assembling material for a solo project when a chance meeting with fellow musician Robert Gorzon sidetracked his plan, leading instead to the formation of the four man group Superdrama. Although still active in that group, Klarmann's musical aspirations were somewhat constricted within the framework of Superdrama. So in 2005 he re-channeled his priorities back to establishing a solo career where he could explore an unrestricted musical pallet. Undaunted by his friend's desire to pursue a solo career, and finding a musical soul mate in Klarmann, Robert Gorzon eventually worked his way into Klarmann's solo project. The pair used MySpace as a sounding board for the music they produced; and as a result sparked the interest of drummer Ulf Jacobs who became the final piece of the puzzle. So Klarmann's proposed solo project was once again thwarted and by 2008 the band Argos had signed on to the French label Musea Records. Their self-titled debut album was released in January of 2009. In 2010 Argos added a fourth member, guitarist Enrico Florczak. This new expanded four-piece unit then released their second album for Musea entitled, "Circles". Argos appeared on the Musea Flower Kings tribute album before finally switching labels and joining the Progressive Promotions. Bringing us to the 2012 release "Cruel Symmetry". Argos lists such diverse influences as: Genesis, Yes, Caravan, Camel, Fruupp, Stackridge, Hatfield and the North, XTC, Klaatu, Soft Machine, England, Eberhard Weber, Kraan, Helmut Hattler, Richard Sinclair, Pekka Pohjola, Jaga Jazzist, Joni Mitchel, Steely Dan, Kit Watkins & Happy The Man, Patrick Moraz & Refugee, Dave Stewart, Dave Sinclair, Bill Bruford, Robert Wyatt, Ian McDonald, King Crimson, Van der Graaf Generator, Pulsar, Gentle Giant, UK , Bo Hansson, Renaissance, The Beatles, Uzeb, Focus, E.S.T. , Herbie Hancock, Miles Davis, Sun Ra , Return to Forever, and Eric Dolphy. To my ears the major influences heard on the recording are Peter Hammill and Van Der Graaf Generator, Gentle Giant, Camel, Tangent, Kino, PFM, Zappa, and National Health. Vocalist Robert Gorzon could flawlessly front a Van Der Graaf Generator tribute band and does a damn fine imitation of David Bowie and Richard Sinclair. "Cruel Symmetry" might well be the product of H.G. Well's 'Time Machine, since nothing about this album is of the New Millennium. "Cruel Symmetry" is a nostalgic look back at the mid-70s'; when pushing the boundaries and bucking the music establishment was considered a badge of honor. Upstart musicians undaunted by the three-minute time constraints required for a 'Top Ten' hit single set their sites on college and fledgling FM stations that featured new and obscure artists, broadcasting deep and extended LP cuts across the airwaves. The music was sophisticated, challenging, yet melodic. Mellotrons reigned supreme. Harpsichords, flutes, Hammond organs, Wurlitzer and Fender Rhodes electric pianos, Moog synthesizers, acoustic and electric guitars, exotic stringed instruments, woodwinds, and all manner of percussion transported the listener to pastoral medieval other-worlds where vocalist weaved tall tales of wonder with tongue planted firmly in cheek. This is the music of Argos; combining elements of pop, folk, psychedelic, jazz fusion, symphonic, and medieval and baroque sensibilities to create a whimsical neo-Canterbury category within the ever-expanding progressive rock family tree. Wikipedia describes the Canterbury Sound as follows: "The real essence of the 'Canterbury Sound' is the tension between complicated harmonies, extended improvisations, and the sincere desire to write catchy pop songs. In the very best Canterbury music...the musically silly and the musically serious are juxtaposed in an amusing and endearing way. Canterbury music is laced with light-hearted whimsy, psychedelic roots, touches of psychedelia, rather abstruse lyrics, and a use of improvisation derived from jazz are common elements in their work." Argos may be a German band but the tunes on "Cruel Symmetry" have a decidedly British 'Monty Pythonesque' feel to them. The keyboard work has more in common with artists like Alan Gowen (Gilgamesh, National Health, Soft Heap), Dave Stewart (National Health, Hatfield And The North, Egg), Pete Bardens (Camel), Hugh Barton (Van Der Graaf Generator), and Derek Shulman and Kerry Minnear (Gentle Giant) than flashy rock keyboardists like Keith Emerson, Rick Wakeman, or Tony Banks. Since Argos don't fit quite comfortably in the neo-prog category I'll christen them with a label of my own choosing ... 'Neo-Canterbury Vintage Prog' - analog anarchists born in the digital age. "Cruel Symmetry" is comprised of seven tracks of varying lengths including the epic opening title clocking in at 20+ minutes, which sounds like a lost track from the "Pawn Hearts" recording sessions. Robert Gozon's opening vocal lines transported me back to the very first time I experienced Van Der Graaf Generator. "Paper Ships Dreams" has a great jazzy Soft Machine/Caravan flavor with the soothing vocals reminiscent of Richard Sinclair. "Chance Encounters" opens with crunching guitars then transforms into an uptempo jazzy number with shades of the Bill Bruford album "Gradually Going Tornado", or something from Pierre Moerlen's Gong. "The Story Of Flying Robert" is a light-hearted tale for fans of Caravan, Hatfield And The North, or the obscure Robert Fripp album "The Cheerful Insanity Of Giles, Giles And Fripp". And heavier tracks like "Caught Within The Light" and "Open Book" share the symphonic art rock elements of bands like Arena, Kino, IQ, It Bites, and early Crimson - as well as Van Der Graaf Generator for quite an interesting combination. No filler or wasted tacks anywhere on the album. The Argos line-up includes: Thomas Klarmann (basses, flute, synthesizers, Mellotron, Hammond organ, acoustic guitars, programming, soundscapes, lead/harmony vocals), Robert Gozon (lead/harmony vocals , acoustic & electric pianos, Hammond organ, acoustic guitars, strings), Ulf Jacobs (drums , percussion , Roland Drum Machine , backing vocals), Enrico Florczak (electric and acoustic guitars and effects), and guest musician Dieter Gunterman (Alto Saxophone). And in this age of harsh audio dynamics as producers jack up the digital compression range to a mind numbing 10:1 ratio for that popular 'louder is better' mindset, it's a joy to these tired old ears to experience an album with the kind of warm production values one associates with vinyl LPs and analog recording. "Cruel Symmetry" should appeal to Canterbury fans, as well as Gentle Giant, Van Der Graaf Generator, Yezda Urfa, Camel, Klaatu, and Tangent. Actually this album should appeal to anyone with a good set of ears and a love of progressive music. The German band ARGOS started out as a two person venture back in 2005. Since then they finalized their line-up as a trio first and a quartet later, and released two full length albums through Musea Records, the most recent of these in 2010. Come 2012 and this foursome have now been added to the roster at the German label Progressive Promotion Records, which released their third album "Cruel Symmetry" towards the end of the year. Analysis. On their first two albums, Argos was a band that chose to perform material with plenty of nods to their main influences. Fans of Genesis, Gentle Giant, The Beatles and the aficionados of the Canterbury tradition in the UK could have a field day in uncovering lyrical and musical nods to specific artists and to some extent even specific songs when listening to those albums. The fun and interesting part of this was that this wasn't done in a derivative manner, but rather in a respectful way. Often with a subtle, tongue in cheek humorous attitude admittedly, but always with a high degree of respect for the traditions of the legacy visited and explored. Which made for two albums easily meriting a description as charming. On their third album Argos appears to have come much closer to establishing a specific sound of their own: not that it's a major break from their first excursions by any means, it's actually pretty close in sound, style and expression, but because this time around it's harder to track down specific origins to the compositions as a whole as well as to the individual themes and sequences. Avid fans of the artists and traditions mentioned previously will probably still have a field day here, but it takes people with a much deeper knowledge to be able to do pinpoint exact origins of the bits and pieces that make up these compositions and the movements within them. One of the most curious aspects of this new CD is how it comes across with such a distinct and purebred British sound, and I might as well add the word vintage to that description. A few details aside this is an album that could have been made back in the 1970's and always with that undefinable British mood and atmosphere. A major part of this is due to the whimsical movements: there's always room for a subtle play on words, a playful instrument detail or a whimsical thematic detour or insert. Then there's the vocals, spoken like and calm in a manner that have seen other throw Peter Hammill references at this band quite often. That the band alternates between gentle piano or acoustic guitar based themes with something of a folk orientation, more sophisticated themes with Mellotron or organ textures applied on top and a fair few variations of both sporting jazz-oriented details and motifs further enhances that British sound presumably. With some gentler sequences of Camel-style symphonic art rock added to the mix alongside harder edged guitar and organ driven excursions in the style of Genesis and the occasional brooding passage closer to the likes of Van der Graaf Generator the British references do keep stacking up quite nicely. Adding a bit of variation and unpredictable details to this landscape is melodic guitar soloing closer in expression to what neo progressive bands tend to utilize, and clever use of grittier toned, hard rock oriented guitar riffs. Especially when the latter is combined with gentler, pastoral themes the combinations can be breathtaking, as documented quite nicely on a piece like Chance Encounter. Still, for the majority of people taken a shot at this band it'll be opening and title track Cruel Symmetry that will make the strongest impression. More than 20 minutes of vintage-oriented and varied progressive rock with a mood and atmosphere so British that you kind of expect to get scones and afternoon tea served with it. Conclusion. If you have an affection for British progressive rock of the 70's in general or find bands with a distinct sound and atmosphere inspired from artists of the symphonic and Canterbury tradition from that time and place to be of general interest, Argos is a band that merits inspection. Especially if you enjoy a band that sticks to a light toned and fairly whimsical overall sound and expression. Started as a solo project in 2005 by multi-instrumentalist and composer Thomas Klarmann and eventually expanding into a trio for the release of their first self-titled album in 2009, Argos released their second album, Circles, in 2010 and this third album, Cruel Symmetry, at the end of 2012. Joining Thomas, who contributes bass, flute, synthesizers, Mellotron, Hammond organ, acoustic guitar and vocals, is Robert Gozon, who moves between acoustic & electric pianos, Hammond organ, strings, acoustic guitar and vocals. Rounding off the group are drummer Ulf Jacobs and guitarist Rico Florczak. This is another album of retro-prog, albeit with more than enough charm of its own to make it rise above some of the more plodding fare I've had to sit through of late. This time round, the '70s influences are of a Canterbury nature, rather than the all-too-common Genesis/Yes template, which at least makes for an interesting change. It took me quite a few listens to get into the first track, yet another song of epic length for 2013, and one that I consider would have been better off ending the album. I can't fault the band's confidence in kicking things off with a twenty-minuter, but have they the chops to pull it off? Just about, yes, and this gives the impression of what Genesis may have sounded like had they crawled fully formed out of a Canterbury cellar rather than having emerged from Charterhouse public school, blinking naively in the sunlight. Yes, it's derivative, but it has a certain appeal nonetheless. For once writing and singing lyrics in a second language presents no problems. The lyrics are obtuse, abstract whimsical observations that have that peculiarly "English" character, despite being written by a German, and Thomas sings in such an unaffected manner, you might imagine he's Richard Sinclair's nephew. He even manages to sing the line "what a wonder life can be" with only the very slightest hint of Germanic inflexion. Top marks! Instrumentally this epic goes through all sorts of twists and turns, from Genesis-symphonic, to Egg-convolutions, and there's a really nice guitar break from Rico slotted in, too. Despite all that, I still get the impression that it is long for the sake of it, as thematically it seems somewhat disparate, and although I have listened to it a number of times I still cannot quite get a handle on it. Having an epic to start the album has given the thing a "game of two halves" feel to it, and to be honest, I prefer the second half which kicks off with Paper Ship Dreams, a jaunty little ditty that sets the template and gets my toes tapping in 23/8 or whatever. This is the kind of Canterbury infused pop song I could listen to all day. Nice! Chance Encounters manages to throw in a few XTC references for good measure, and the resulting combination is something a bit different that definitely works. The shorter songs give lyricists Robert and Thomas the chance to be concise and their writing here certainly benefits from the enforced brevity. Mild cautionary tales, songs of hope, love and redemption, along with an adult nursery rhyme or two are all well written, and credit to Robert and Thomas for penning some really fine words, a particular bugbear of mine where progressive rock is concerned. The Story Of Flying Robert is a favourite, as it relates the tale of a young boy who likes to venture out in the wind and rain when it is probably wiser to stay indoors. His umbrella, caught by the wind bears him aloft: "There goes Robert, and his hat goes North". See what they did there? The tune itself could be Hatfield too, but by now I've forgotten all about the influences this charming little band sometimes wear brazenly on their sleeves, such is the accomplishment of the ensemble. Argos even manage to get a bit angular on the closing song Open Book, which combines all the previously mentioned influences and comes up with something that while maybe not shockingly unique, is still worthy of your attention. Yo creo que no se tienen que perder la oportunidad de escuchar este disco para ver si les gusta la banda, creo que se sentirán más que satisfechos con lo que encontrarán aquí. Se los recomiendo. no hay links, podria verse esto? Genial Lino!!! entonces me ahorro la subida, espero tus links entonces! Abrazos!!!! Y muchas gracias por presentarnos la banda! Algo pasa, Moebius, porque sigue saliendo "Este archivo no existe, el acceso al siguiente archivo está limitado o el archivo ha sido eliminado por la violación de los derechos de autor". Gracias Moe, Disculpen amigos la tardanza, tenia problemas tecnicos pero ya estan arreglados, a continuacion estare posteando los demas discos de esta Banda. Muchas gracias! vamos a investigar!